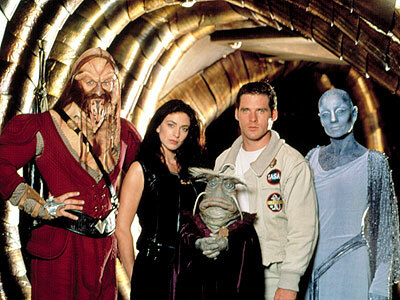 It’s the near-ish future, and space exploration is conducted by an international agency — IASA, as it’s often known in sci-fi properties, particularly those of non-American origin (Farscape is Austrailian). The main character, John Crichton (Ben Browder), is some kind of brilliant engineer and the son of a famous astronaut. Right off, I find him too perfect, and although they are testing a technology he developed himself, have to wonder if he got where he is on his dad’s coat tails. For all his wide-eyed innocence and high school quarterback good-looks, he’s kind of a boring character. “Each man gets a chance to be his own kind of hero,” his father tells him in a Polonius-esque speech at the beginning. In the pilot, though, John is someone who has stuff happen to him, instead of acting heroically. Although, I guess the same could be said of Luke Skywalker, so perhaps I’m being too critical. So I’ll just tell ya what happens. Upon attempting an unprecedented act of physics in a space ship, John is accidentally sling shot (slung shot? slung shat?) through a worm hole and, once on the other side, involved in a hit-and-run with another ship. The captain who blows up with the other ship turns out to be the brother of somebody pretty important. It’s worth elaborating about Rygel a bit. The show was co-created by Brian Henson and produced by the Jim Henson Company, and the puppet characters are unmistakable. They’re brilliantly done, natch, and give the show an air of nostalgia for we the Muppet generation. Also, at one point in the pilot Rygel utters the phrase, “It’s a trap.” So I like him. Inside the cell there is another prisoner, clad head-to-toe in black armor. Here’s how that character introduction goes down: Person looks scary in armor. Person takes off helmet and proves to be a woman (i.e. not scary). Hero approaches her sans caution and discovers she is a badass indeed. The important thing this pilot sets us up to understand is that the audience is on the side of the “bad guys,” while the “good guys” are the enemy. The armored woman, Aeryn, is a member of the military police called–naturally–“peacekeepers.” (Isn’t that what they’re called in The Hunger Games, too?) So you know they’re bad. All of the other inhabitants of the ship are prisoners. They land on a planet that looks a lot like a location from Hellboy 2. Although Aeryn literally doesn’t know the word “empathy,” John makes a chivalrous choice that shows compassion for her. So she becomes a bad-guy-gone-good, as a member of this merry band of misfits. We’re now set up for any number of space travelling hi jinks as this group gets to know one another and John attempts to find his way home. Here’s everything you ever wanted to know about this show. This entry was posted in 1990s, Dramas and tagged Ben Browder, brian henson, farscape, iasa, jim henson, muppets, sci-fi, science fiction, space travel by meekthegeek. Bookmark the permalink.